Following the American Civil War, the British became concerned that the victorious Union would take revenge for their support of the Confederacy. To protect the Royal Naval Dockyard against a possible land attack the British Army’s Royal Engineers began construction of Fort Scaur in the late 1860’s. It was a huge project involving the excavation of a dry moat cutting right across Somerset Island from Ely’s Harbour to the Great Sound. Ramparts were constructed on the northern side of the ditch, creating a killing zone below. The fort was protected by two 64 pound guns mounted on disappearing carriages that recoiled for reloading after they had been fired. One of the guns is still here. The feared American invasion never materialised. They did eventually gain control of Fort Scaur, albeit welcomed, when US forces were stationed here during World War II. These days the fort is the centrepiece of a pleasant park. The ramparts offer spectacular views of Dockyard and the Great Sound, and the moat has been rejuvenated as a floral garden. Visitors are welcome to explore the gun emplacements and rooms of the fort. 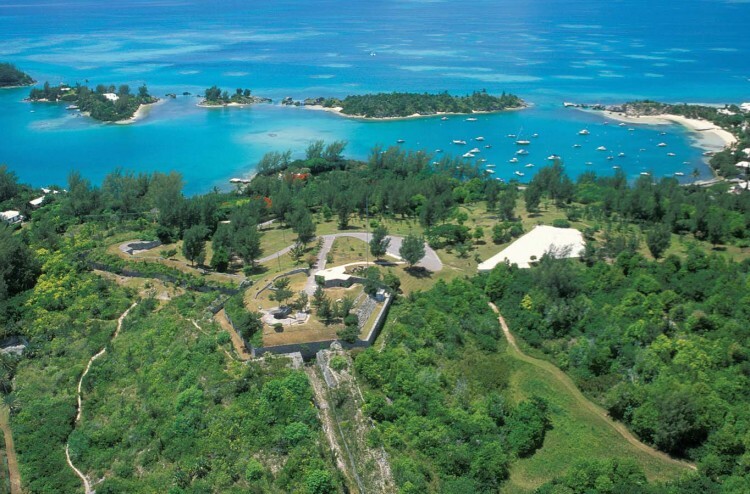 Fort Scaur is situated in Sandys, around 4 miles from Dockyard. To travel there by public transport take bus number 7 or 8. 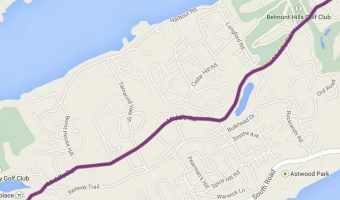 Both travel between Hamilton and Dockyard. There is free parking for scooters and cars. The fort and park are open every day of the week. Admission is free. Other attractions in the area include Somerset Bridge, Somerset Long Bay, Hog Bay Park, and the Heydon Trust Chapel. 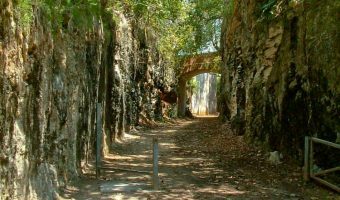 The fort is also on the Sandys section of the Bermuda Railway Trail. As noted above the fort offers spectacular panoramic views and good photo opportunities. Other places in Bermuda with great vistas include the Gibbs Hill Lighthouse, the Bermuda Cathedral, and Fort Hamilton. Map showing location of Fort Scaur. 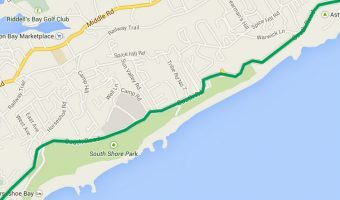 This is a very nice stop if you are going to the Royal Naval Dockyard by scooter. It is easy to miss so keep a close look out for the entrance. Go up to the fort and you will be rewarded with some great views. Close to here is a small church called Heydon Trust Chapel. It dates back to the 17th century and is one of Bermuda’s oldest buildings. You can get fantastic views of the Great Sound from here.